Finally, the weekend was here! We felt robbed last weekend with the rainy weather and were looking forward to exploring & enjoying our new neighborhood to the fullest. Starting with right inside our community. I wanted to explore every amenity. I started with the essentials and handed in my resident forms to the concierge. Paper. Ugh. To be honest, a bit of a repetitive task since it was essentially the same info I’d already filled in with my rental paperwork (and they were related companies.) Teachable moment for us. 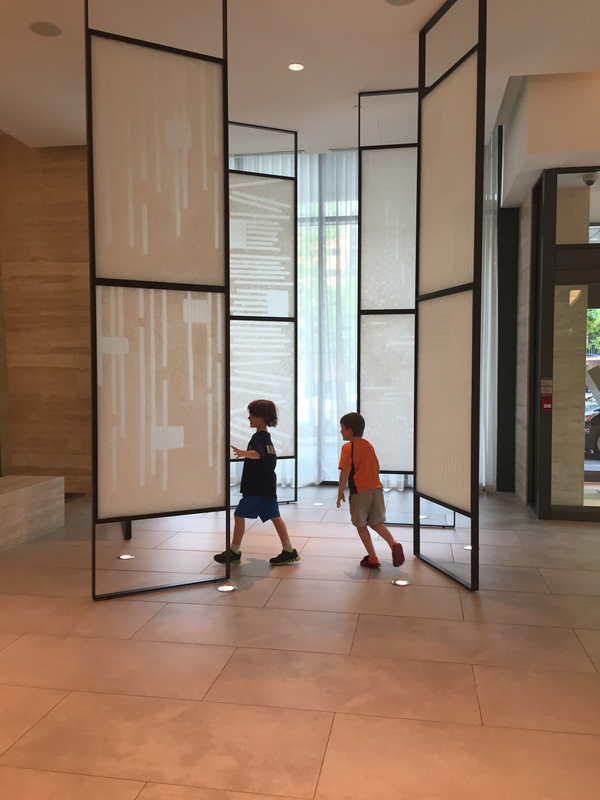 Interesting lobby design that makes for a creative space, worked to my advantage and kept the boys busy while I spoke with the concierge. He is so lovely! A wonderful presence when you walk in. That is so critical in any community. Regrettably, I discovered that for the next few weekends during my stay, the party room is booked solid 😦 This is clearly a young, active community and residents love to entertain (outside of their suites). At least I was able to get a bbq and dining room reservation for a couple of hours next weekend. The weekend started with a splash! Literally. An early morning swim for the littlest one and his dad. Followed immediately after, by an outdoor activity to burn off the a.m. energy. Three boys. They decided to put the track right outside their front door to good use. With helmets in hand(s), we headed down to the locker to get our bikes and rollerblades. On our way, we noticed a sign in a parking stall that we pass by every day. 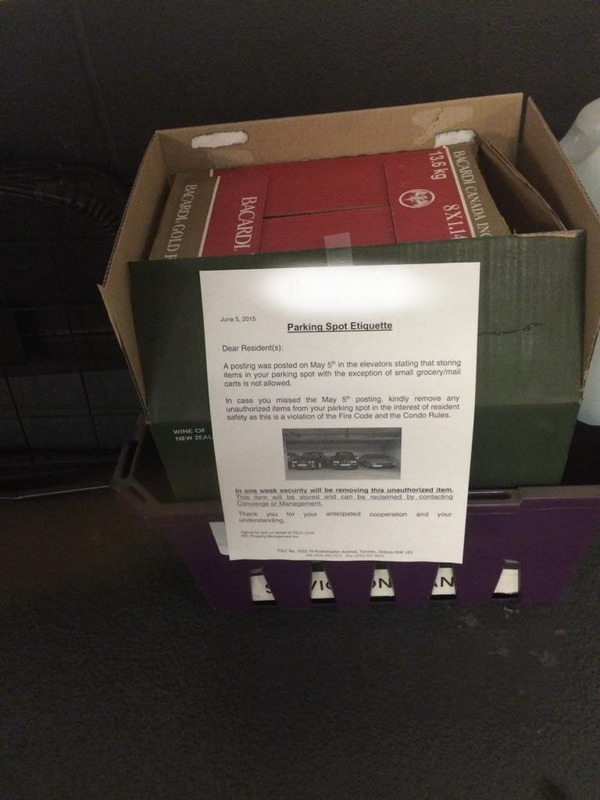 It turns out that not only is there Pet Etiquette in this community, but there’s also Parking Garage etiquette. It basically asked them to remove the “tchotchkes” in their parking stall. Not in those exact words. Sometimes there’s resident frustration with what seems like trivial regulations but there’s often a reason. It turns out that in this case, it’s a fire code violation. When you hear things like that, you end up being grateful for a well managed (and safe) community. This was going to be a perfect day to practice bike riding. The little two ditched the training wheels last week and were mastering their two wheelers. With no cars to hit them and no pedestrians for them to hit, this was nirvana! The only hazard was straying soccer balls from the games being played on the field. Fate would have it, that the littlest one’s front wheel turned into a bulls-eye for them (unintentionally). To everyone’s amazement including his own, he kept peddling. Click and watch him dodge the soccer balls! Well, after the boys had expended (some of) their energy, we agreed it was a good time for me to personally explore the new neighborhood, “mommy-style.” I walked to some of my favourite retail on Yonge and while it was tempting as there’s so much within reach, I have to admit I’ve turned over a new leaf and become a bit of a minimalist. When you consider your space, you re-consider your purchases. There becomes a far clearer line between needs and wants. And that, I learned, is a great recipe for accumulating less “tchotchkes” in my own closet. Next Post Day 5. Missing the backyard. Previous Post Day 7. Turf, cheating & Sunday dinner.